I've always been keen on curating memories and capturing those precious moments, as I'm sure many of you are if you're a hobby photographer or blogger like myself. With digital technology so evolved now, and social media so big, it has never been easier to document and curate memories, however I'm also very much a fan of recording things physically. I think in this digital age we store things and then can sometimes easily forget about them, however I want my son to grow up being able to look at photos and such from childhood in a tangible physical form like I did - I've written more about this here. We choose to scrapbook as a family; we scrapbook over putting photos in a photo album as I think it a more personalised way of showcasing those memories and experiences. 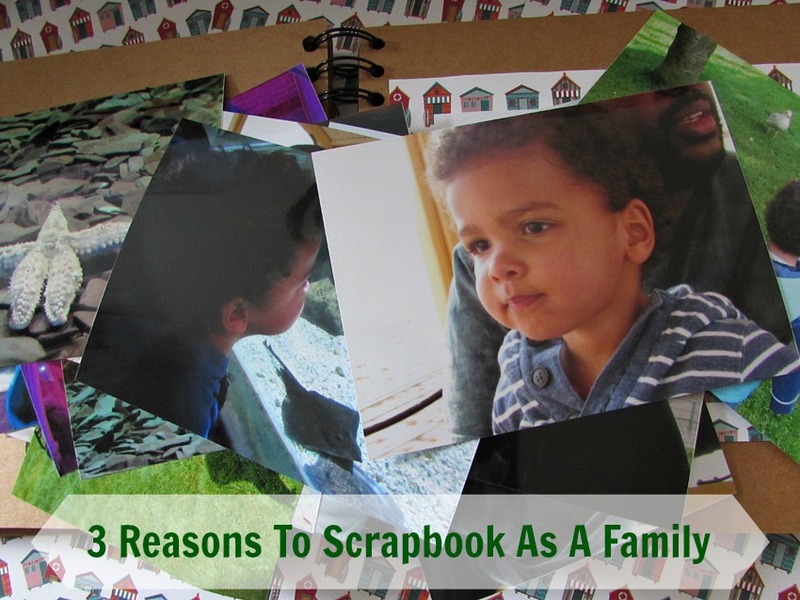 Today, I'm sharing three reasons I recommend scrapbooking as a family. Although the dynamics of every family are different, it can be hard to spend time together as a whole family - perhaps both parents work full time jobs, or your children are busy with after school clubs. Having an activity that brings you all together is a great way of spending quality time together; scrapbooking is a thoughtful and meaningful activity that can help a family to connect and bond. Scrapbooking is so much more than just sticking a few pictures down, as is the case with a photo album. The act of scrapbooking really gets you thinking and you use a lot of artistic skill and creativity in the process. Whether you have younger children, like myself, or older ones, there are many benefits to creative based activities... Also, it can be a lot of fun for adults too! It seems pretty obvious, but if just the one person is documenting family memories, travel or otherwise, of course you're just going to have one perspective of that given time. When all family members come together to log an event or trip or whatever it may be that you're scrapbooking, there are multiple memories shared and overall a wider experience recorded. Something we add to our scrapbook is a log of our travels - currently my partner and I write them as Alexander is only 3 but we do talk to him about things and add his commentary - and we both have different styles of writing. Also, you may be surprised at the little memories your children retain, whilst you may well have just forgotten. DO YOU SCRAPBOOK AS A FAMILY? IS IT SOMETHING YOU'RE INTERESTED IN? Next to making memories, saving them is one of my favourite things Tom. A lovely hobby. I try to make a digital photo album each year as I think it's a shame for all our photos to be stuck on the computer. That sounds lovely too, Claire!